Popular boy band BTS has made K-pop history, placing 1st on the Billboard 200 chart. 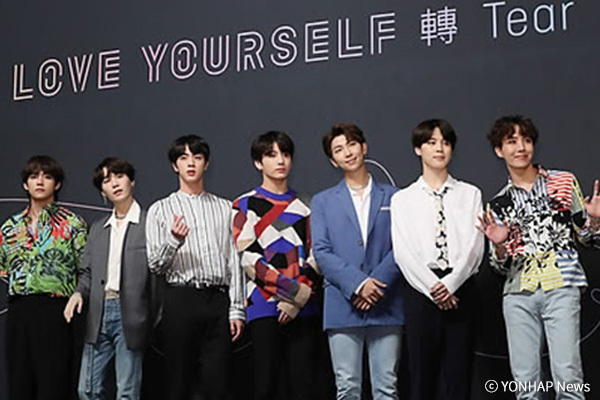 The band’s new album, “Love Yourself: Tear” ranked #1 on the Billboard main albums chart which was unveiled Sunday (local time) on the online edition of the Billboard magazine. The album, which is the group’s third full-length album, also became the first primarily non-English album to top the chart in over 12 years. The Billboard 200 ranks the most popular albums of the week in America based on traditional album sales, track equivalent albums and streaming equivalent albums. The highest-charted K-pop album previously on the Billboard 200 was BTS' "Love Yourself: Her," which ranked seventh in September 2017.